yagna in Dabhan, naming him Gunatitanand Swami. 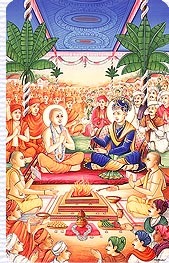 During the grand yagna, Lord Swaminarayan revealed Muljisharmane deekshaam dadaanasya prajaayate, Bhuyaanme-tra samaanando yato Dhaamaaksharam sa me. i.e. I am extremely happy to initiate Mulji Sharma who was born in Bhadra. He is My divine abode, Akshardham. Lord Swaminarayan's divine abode is Akshardham, who manifested as Gunatitanand Swami. He is also known as Aksharbrahman, mentioned in the Upanishads and Gita. According to Hindu Dharma's eternal concept of dual worship, of the Lord with His choicest devotee or consort, such as: Narayan with Lakshmi, Rama with Sita, Shiva with Parvati, similarly, Lord Swaminarayan or Purushottam is worshipped with Gunatitanand Swami or Akshar. Hence the name Akshar Purushottam. 'Akshar diksha' denotes that an aspirant needs to become 'Akshar-rup' in order to attain the Lord Purushottam. One believes himself to be Brahman, above the 3 bodies, in order to offer worship to the Lord (Shikshapatri 116). To overcome body-consciousness and to then identify one's atma with the manifest Aksharbrahman, also known as 'Pragat Gunatit Satpurush,' is the true meaning of Akshar diksha. This is the ultimate 'Mahotsav'-festival of life and the final goal. The festival is celebrated in all BAPS mandirs. However, it is celebrated in Dabhan on a large scale every year, since this is the sacred place where Lord Swaminarayan initiated Mulji Sharma.